The trader was unanimously acquitted of one charge of conspiracy to defraud. Other defendants have been convicted of reference rate manipulation, including Christian Bittar, Philippe Moryoussef, Carlo Palombo and Colin Bermingham. In the re-trial that started in January, Counsel for the SFO argued that the defendants worked together and with other traders at Barclays, Deutsche Bank AG and Societe General between January 2005 and December 2009 to submit “false or misleading” estimates to the process for setting Euribor rates. The SFO’s probe into Euribor was part of an investigation launched in 2012 into interest rate manipulation that prompted an overhaul of rate-setting rules. If you would like to find out more, or instruct Amanda or Christopher, please contact the Practice Directors. Amanda Pinto QC is a barrister at 33 Chancery Lane. An expert in international financial wrongdoing, Amanda specialises in some of the most high-profile cases within the field. Described by the Legal 500 as: "Immediately liked and respected by clients as a real heavyweight" Amanda is among the biggest names currently practicing at the bar. In her spare time, Amanda is an advocate for the First 100 Years project and is a champion for diversity and inclusion. In this article, we catch up with Amanda to discuss her average work day, her professional journey and ask her to share some advice for graduates just entering the profession. My alarm goes off and… regrettably, I always check my phone to see how many emails I have and if any are urgent. How I got my job? I started in a common law commercial set which gave me a good general grounding in several practice areas. I did my third six months pupillage at 5 Paper Buildings, a criminal set, where I loved the advocacy, the fact that I could help people in very difficult circumstances to get their case across, the daily diet of varied cases in the magistrates’ court lists and Crown Court appearances and the great characters and amusing stories told in chambers when I returned. I was one of two female pupils and, despite being the first tenancy applicants to have a democratic Chambers vote (and not the blackball system), we nearly didn’t get taken on after the vote was overturned the following day by senior members of the all-male set protesting. Luckily our respective pupil-masters and others reversed that second decision. My most memorable career moment? Apart from the roller coaster of getting tenancy, professionally, I have had the good fortune to be in many interesting cases. The most memorable moment outside the courtroom was learning that my application for silk had been successful, sitting on a box in the photocopying room of Southwark Crown Court, with a jury out in one case and preparing for the next. It was a perfect mixture of the excitement of becoming a QC, with the grounding reminder that our not-so- glamorous daily work is what it is all about. Many memorable moments happened when making mistakes from which I learnt the hard way! As a woman in law, I… thoroughly enjoy my work despite it being hard to fit in with having a family. Professionally, I have often found that people underestimate you. I am encouraged that many discriminatory practices are diminishing but we still need to keep everyone focused on driving forward changes to help women flourish and stay in practice. The Bar Council supports women with initiatives such as persuading the government against introducing the so-called Flexible Operating Hours in criminal courts which would have made it impossible to organise caring responsibilities for barristers and diversity training for Chambers, but there is still much to do to stop the significant problem of retaining excellent women, particularly the self-employed at the publicly funded Bar. In my experience, it is harder for a woman to progress as fast as a man. I hope the fact that I am the fourth female Vice-Chair of the Bar (and the 3rd in 8 years) will serve as a sign that, although women (particularly with a family) may face significant difficulties, we can thrive and get to the top of the profession. Supportive practice managers, clerks, colleagues at work and family and friends at home are crucial. Actively value those who allow you to progress your career by supporting you at home! My typical day? The joy of the criminal Bar is there isn’t one. What advice would you give to someone beginning their career as an advocate? Do not be too wedded to a single career path. Thinking you only want to do one area of law may hem you in too much. I never intended to do crime, but I loved the daily advocacy and the human element together with the immediacy of arguing the right application of the law as matters arose in the trial or other hearings. I would not swap that for the areas of the law I thought would interest me before I started. 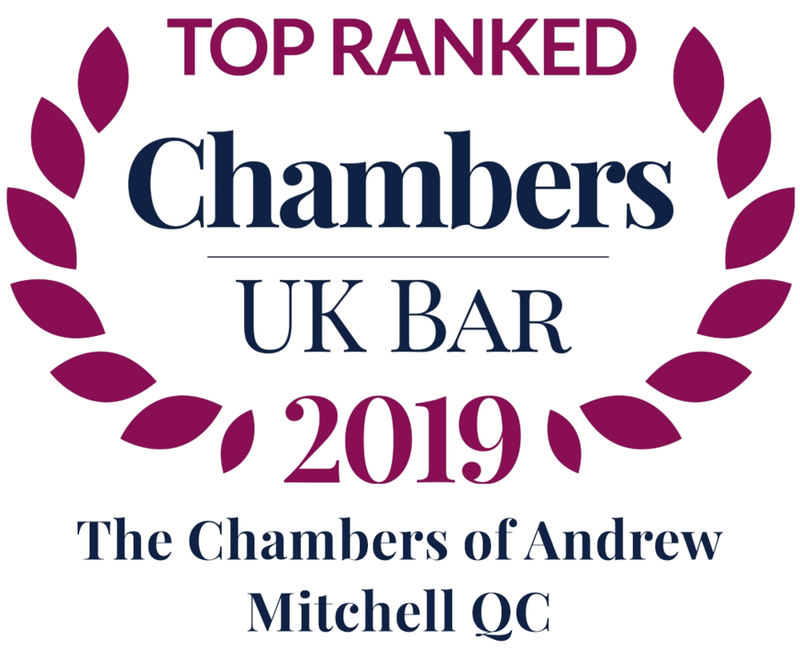 The 2019 version is now published and Chambers fares very well yet again. Chambers and individuals are recommended in Financial Crime and POCA & Asset Forfeiture. Chambers is once again the only Band 1 Chambers for POCA & Asset Forfeiture. Additionally, individuals are recommended in Financial Crime: Corporates (Amanda Pinto QC) and Civil Fraud (Ian Smith). Impressive set with a well-regarded practice in financial crime and related confiscation cases. It is recognised for its defence and prosecution of individuals in notable SFO cases, as well as for its expertise in advising corporates on financial crime investigations. Recent cases handled by members include Operation Holt, a case involving insider dealing during Logica's £1.7 billion takeover by CGI Group Holdings Europe. "They are very good, efficient and organised. Martin Adams, the practice director, is a very good clerk who can be relied upon to have an up-to-date grasp of key case authorities and legislation." "You get very good service from the clerks and are well looked after." A well-known heavyweight silk who is a great choice of leading counsel for high-value matters connected with financial wrongdoing. His reputation has spread far and wide, ensuring he is instructed to advise on marquee matters both at home and abroad. He offers particular expertise in large-scale bribery and corruption investigations, and is also valued for his expertise in related POCA proceedings. "A very bright and talented barrister" who is "a difficult opponent to get the better of." Recent work: Acted in the investigation and prosecution of individuals on charges of corruption, fraud and money laundering further to a Commission of Inquiry into a number of property developments in the Turks and Caicos Islands. A barrister with great interpersonal skills who gets the best out of clients and the judiciary and is noted for his attractive advocacy style. "A fantastic advocate" and "a seasoned campaigner who gets straight to the point." Acts for the prosecution and the defence in serious financial crime cases, including those involving misstatement of financial accounts, investment frauds and money laundering. Interviewees reserve special mention for her easy-going manner and clear commitment to obtaining the best result for her client. She is valued for her advice to corporates on financial crime matters, and also has experience of dealing with private prosecutions. "Always ahead of the game, not just in terms of the bigger picture and tactical decisions that need to be made but also in terms of the detail." "She has a razor-sharp intellect." Recent work: Instructed in the defence of Sisse Bohart, a junior submitter who was charged in relation to the alleged manipulation of Euribor. Has superb legal knowledge and great judgement in how best to advance the client's cause. He regularly handles corruption cases and all manner of investment frauds, including those relating to Ponzi schemes, and is noted for his skill in money laundering cases. He draws on complementary expertise in confiscation matters and those with a civil fraud aspect. "Bright, hard-working and someone with great client skills." "He has a formidable intellect and is strategically very astute - he commands the courtroom." A silk noted for his attractive presentation style in court and for being a good team player. He regularly advises on allegations of money laundering and overseas corruption, and he is also experienced in related POCA work. He provides expert counsel to a variety of corporate clients, and has a particular focus on cases with overlapping civil and criminal elements. "He is tenacious, intelligent and hugely effective both on paper and in court. His written work is succinct and his ability to think out of the box is hugely impressive. Very strategic in his approach, he is able to adapt and think on his feet effortlessly." Puts clients in stressful situations at ease and speaks to them in a style they can readily understand, according to those who instruct him. He frequently acts unled, acting for the defence in high-value cases. His caseload includes a number of tax fraud, corruption and trading standards matters. He has noted expertise in major bribery cases. "Fantastic with clients, very, very knowledgeable and very experienced, he knows everything there is to know about fraud cases." Recent work: Acted for a defendant in Operation Holt, a case involving insider dealing during Logica's £1.7 billion takeover by CGI Group Holdings Europe. Recognised for the diligence, great attention to detail and fine advocacy skills that he brings to the defence of fraud and financial crime cases. Rate rigging and corporate theft matters feature highly in his caseload, as do complex money laundering matters. He is experienced in advising clients on international matters. "Meticulous and very good in court, he deals with complex cases very well." "He is extremely hard-working and sees the points very clearly." Recent work: Acted for a defendant in a case alleging a large broadcasting rights fraud in the North of England. A careful barrister with great powers of factual recall and a highly supportive junior counsel, who adds clear value to proceedings. He is highly rated for his astute defence of clients in financial crime cases. His experience includes advising on high-value allegations of tax fraud and international money laundering. He offers additional expertise in asset recovery, including those cases concerning highly complex, cross-border matters. "An excellent barrister whose knowledge of complementary civil proceedings and of a number of key international jurisdictions sets him apart from many other juniors." Recent work: Acted for a defendant in Operation Amazon, which alleged the setting up of a series of sham connected companies and offshore trusts for the purpose of securing sideways tax relief. A set held in the highest regard by market commentators due to its outstanding proceeds of crime and asset forfeiture expertise. International money laundering, civil and criminal asset recovery, receivership and regulatory issues are amongst the areas mastered by this top chambers. Members frequently represent all manner of clients including prosecuting agencies, defendants, regulatory bodies, receivers and affected third parties. They successfully represented the Federal Government of Nigeria in a recent case concerning the recovery of USD80 million stolen by the former Oil Minister of Nigeria. One impressed client says: "It's a brilliant set for POCA and asset forfeiture as practically every one of its barristers has vast experience in those areas." The clerks, headed by Martin Adams, are praised by sources for their supportive nature: "They are extremely helpful and nothing is too much trouble for them. They will put themselves out and go the extra mile." "The clerks are very responsive and reasonable, and adopt a practical approach to dealing with any issues that arise during litigation." Extensively experienced in POCA work, he has a practice that covers a wide array of cases including those concerning money laundering, asset recovery, bribery and corruption. He is frequently instructed in high-profile and complex matters, and is considered to be a master litigator, representing clients at the top level including the appeal courts. "Andrew's knowledge is first-rate and his ability to turn around work is amazing - he could be anywhere in the world and would respond in really good time." "As well as having a great legal mind, he has a practical side to him too." "Andrew's main strength is that he is always prepared to think out of the box. He is such a well-established leader in this field that he always brings extra value to a particularly complicated or novel case." Recent work: Acted in Jakob International Inc v HSBC Private Bank, advising on POCA issues relating to a civil action against a bank to recover monies that the bank considered to be the proceeds of crime. Handles specialised financial crime, proceeds of crime and asset recovery cases, and boasts particular expertise in money laundering matters. His clients include major financial institutions and private individuals. "Strategically very astute, he sees a situation very quickly and takes full advantage." Acts for claimants and defendants in proceedings relating to allegations of commercial wrongdoing, and is renowned for his involvement in civil fraud and asset forfeiture cases. He handles cases concerning restraint, freezing and confiscation of assets in both the civil and criminal spheres. "His tactical acumen is particularly impressive - you can trust him with the most serious and complex cases without hesitation." "He has a brilliant analytical mind." Highly regarded silk who frequently handles civil recovery, restraint, receivership and confiscation cases. His clients include private individuals and financial institutions. His practice covers advice on money laundering obligations compliance. "Kennedy is extremely impressive; he is a very able advocate, who marshals his arguments well and presents them in a way that captures the attention of the tribunal." "His knowledge of the area is exceptional." Recent work: Represented a businessman in the largest ever cash forfeiture case on the Isle of Man. The case was heard before the Isle of Man Court of Appeal. Boasts expertise in both POCA and criminal fraud matters, and is particularly adept at restraint, confiscation and civil recovery cases. He represents defendants, receivers, companies and prosecuting agencies amongst others. "Very well prepared and on top of the material; he is very good at the paperwork and has a strong, measured manner in court." "He has the ability to see an issue both through the eyes of the prosecutor and the defendant. As a result, his advice is very clear in terms of where he thinks the right balance lies." Recent work: Acted in NCA v Jonathan Nuttall & others, representing several respondents subject to complex civil recovery application under Part 5 POCA. POCA and asset forfeiture specialist with noteworthy experience in civil recovery and receivership. He acts for prosecuting agencies such as the SFO and FCA, as well as receivers, defendants and companies. His work includes fraud-related restraint and receivership matters. Stancombe has had involvement in a number of cases that have helped to develop the law relating to asset recovery. "Barry's written work is fantastic and when in court he commands respect. He is a persuasive lawyer who wins arguments." "Very bullish and no-nonsense, he is very clear on what should be done." Recognised for her specialist expertise in POCA proceedings, asset recovery and restraint orders in both the civil and criminal spheres. She represents prosecuting authorities, defendants and third parties, and regularly tackles cases with cross-border aspects to them. "Fast-thinking and good on her feet, she is well respected by judges and opponents." "Her paperwork is very thorough and she's a formidable negotiator." Recent work: Acted in the case of Somaia, representing a convicted defendant, in High Court enforcement proceedings. The proceedings were brought against third parties by a private prosecutor seeking recovery from assets, including those held by third parties, which were untainted by criminal conduct. The confiscation order had exceeded £18 million. Frequently acts for defendants and third parties in POCA proceedings relating to allegations of business crime and corporate wrongdoing, and regularly appears before the High Court, Court of Appeal and Supreme Court. He has particular experience of advising offshore trusts on money laundering and compliance issues. "Christopher is very charming and manages to make difficult points well." "He is very thorough and gets to the heart of the matter very quickly." Recent work: Instructed by the CPS Proceeds of Crime Unit in CPS v Christine & Michael Dalton. The matter involved confiscation and enforcement proceedings relating to tax credit fraud and laundering the proceeds of wider criminality. Experienced criminal counsel who assists defence and prosecution clients with fraud, POCA and asset recovery matters. She is also regularly instructed in cases with international elements, including those relating to international mutual legal assistance and international regulatory work. She is experienced at representing clients at all court levels, and is a regular in the High Court and Court of Appeal. "Fiona is one of the most able senior juniors for confiscation work; she is clear-thinking, bright and trusted by judges." "She is very thorough and diligent." Recent work: Instructed by the prosecution in a suspected conspiracy to defraud trial, which would have resulted in a gain of millions of pounds from customers of Solar Energy Savings Limited. Strong POCA practitioner specialising in the domestic and international civil recovery elements of commercial wrongdoing disputes. He regularly advises claimants and third parties on asset recovery matters, and also handles confiscation, fraud and regulatory enforcement. Osman's clients include governments and commercial organisations, amongst others. "He is approachable, jargon-busting, and a man with an eye for an unusual legal argument." "Faisal's relaxed, approachable manner belies his meticulous attention to detail and careful preparation." Recent work: Acted in HMRC v Richards, highly complex confiscation proceedings following a successful appeal by the prosecution of the trial judge’s refusal to make a confiscation order in a very high-value tax cheat case. Commercial litigator and criminal lawyer who has a specialist knowledge of POCA. He is increasingly known for handling more general complex commercial cases with a fraud element. Smith is experienced in civil recovery restraint order and enforcement proceedings, both domestically and internationally. "He is quick to respond and willing to assist, and is someone with very good knowledge." "He communicates very simply and easily with clients, turning complicated issues into simple, easy-to-understand pieces of advice." A civil and criminal fraud specialist comfortable managing complex proceedings involving such issues as asset recovery and money laundering. Much of his work pertains to overseas jurisdictions. He is adept at both bringing and defending claims. "An expert in the field. He understands clients' issues and communicates easily with them." "A knowledgeable civil fraud specialist who is utterly committed to his clients."